Welcome Sonja from Sewing ala Carte! Sonja hails from The Netherlands, and if all Dutch sewists are half as stylish as she is, it must a lovely place to live! Enjoy her dresses! Just like last year I used one pattern for both my Day&Night dresses. I gave a sneak peak of both designs on Instagram but also my fabrics choices for both dresses in this Day&Night Dress Challenge 2018 fabric choice blogpost. 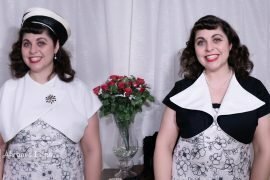 Both dresses are made of a self drafted T-shirt pattern that was altered into a dress pattern. Lots of designers have clothes with and asymmetrical look. This look is one of the 2018 style features. I decided to incorporate this feature in both my dresses. Time to reveal both my dresses. The coffee date dress is made of wide interwoven stretchy (2% spandex) stripped fabric. This fabric has striking dark blue stripes alternated by stripes made of off white, mixed off white/dark blue and off white/black. I sewed the dark blue stripe on the horizontal part of my pattern pieces to get a kind of sporty effect. The pattern of the stripes runs from to front of the shoulder and also the stripes are running through on the body but also on the sleeve as well. The hems are hand sewn what looks less casual when I sews the hem on my coverstitch machine. 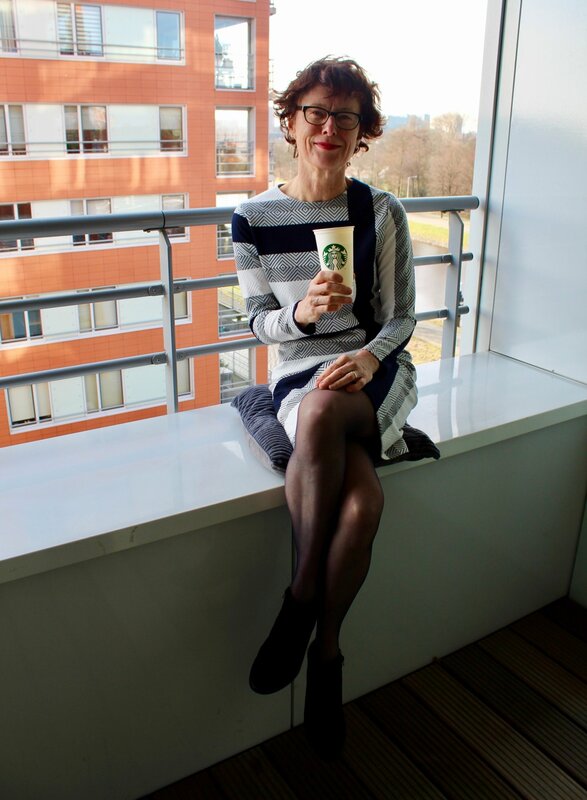 I love wearing this coffee date dress with ankle boots. My black ankle boots with a small dark blue band across my ankle have a great match. My black suede ankle boots with the zebra heel are working too. My finishing touches are the leather blue crossbody bag and scarf with a paisley design. 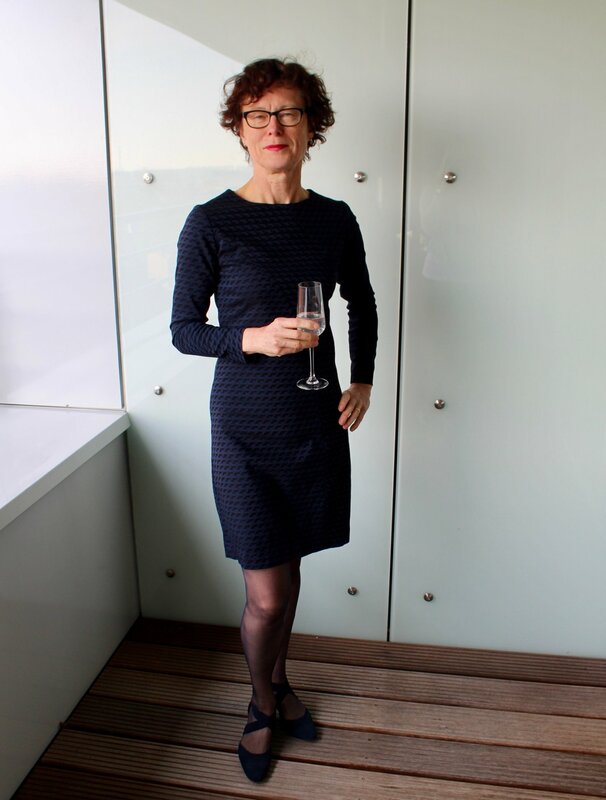 In former days a cocktail dress was always black. Nowadays more colours and designs are possible. 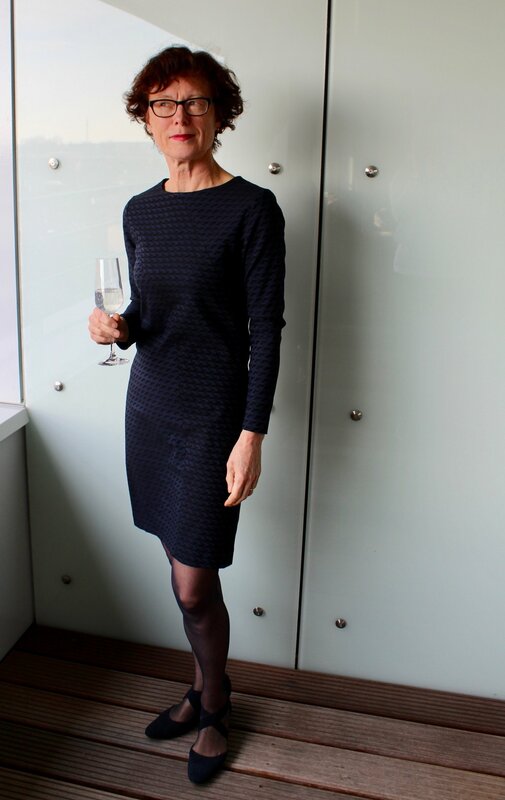 The hemline of the cocktail dress finish on the knee or just above the knee and the style is informal but chique. I decided to make my version just above the knee to create a simple, chic silhouette. My fabric choice had to be in line with this simple, chic silhouette. 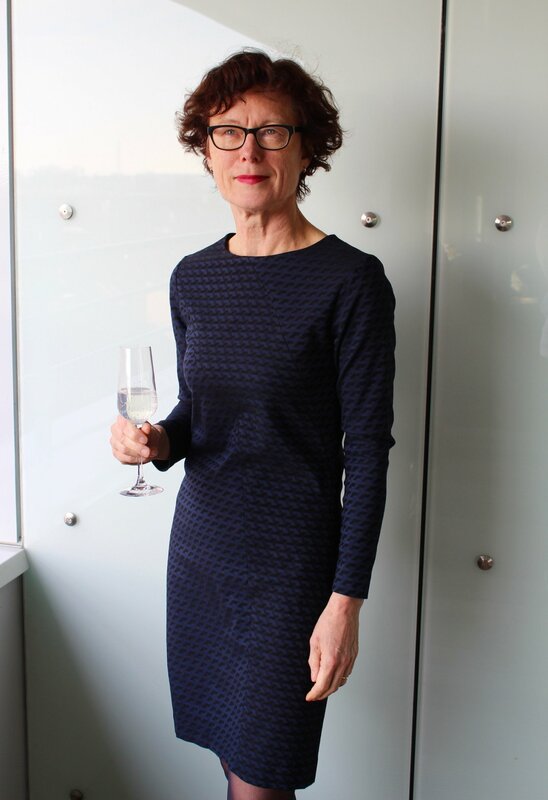 This cocktail dress is also made of a stretchy fabric (5% spandex). This fabric has an inwoven graphic design made of dark blue and black and can be used on both sides. My T-shirt dress pattern was redrafted again and the panel was transformed into a curved line. I used the black side for the panel and the dark blue side for the other parts of the dress. One can’t easily see the inserted panel but the effect is beautiful and subtile. 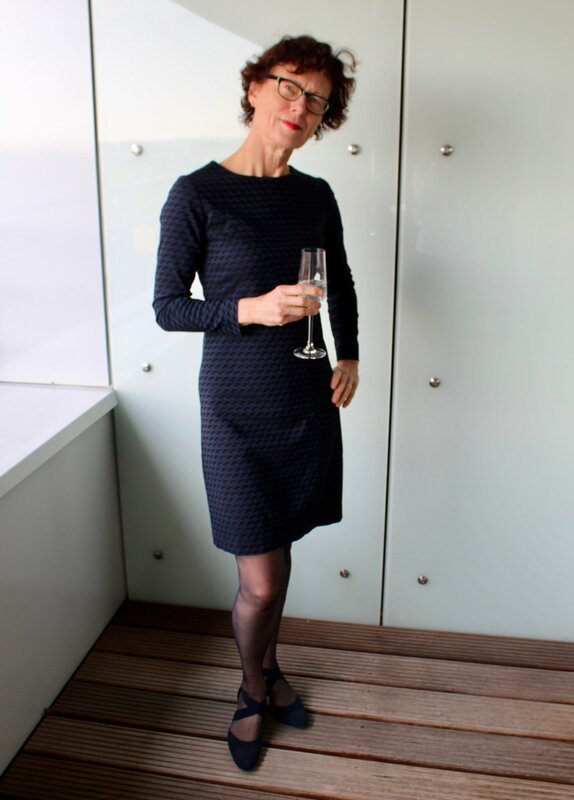 I wear my cocktail dress with blue tights and stylish suede blue high heeled shoes with crossed black bands. A perfect combination for a cocktail party. Such beautiful dresses! I am in love with the stripes dress! Love the placement resulting in such a nice design! You are very stylish in the cocktail dress as well! And so fun to see them both made from the same pattern! Thank you so much. Keeping the right balance between the placement and the stripes was a puzzle. I drew the result first on scale an then on the real size to see if the balance was right between the stripes and the placement. I also wanted to show what one can do with a simple T-shirt pattern. Yes!! Wonderful job on your dresses! Both are beautiful! I love both dresses! The changes you made make them look designer! Thank you so much for your lovely comment. The striped dress is my husbands favourite. Wow! Both dresses are beautiful! Love your styling! Thank you so much. I love making simple dresses with a little twist. Sonja has such fabulous style! 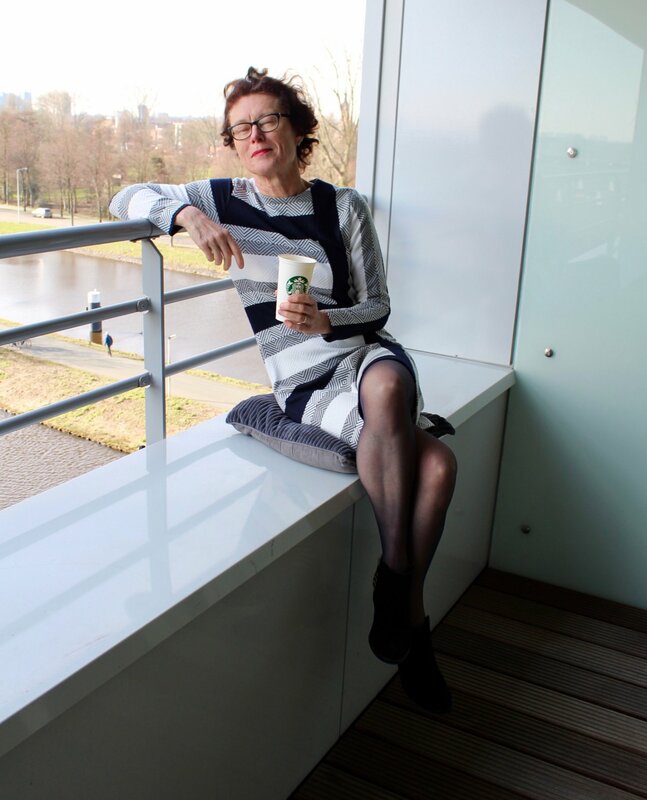 I particularly love the way she arranged the stripes on her coffee dress. Doesn’t she though?! She is one who is always true to her aesthetic and so precise in all of her work! Thank you so much. I love stripe playing. You can find more beautiful examples on my personal blog if you’re interested. This Top is a great example: https://wp.me/p77VK1-1eD. Very chic indeed! I love how you styled each one. The dotted hoisery….I LOVE! Thank you so much for your kind comment. Besides shoes and ankle boots I also have a soft spot for tights with designs. I love both dresses. I could see myself wearing both of them. Thank you so much for your kind comment. 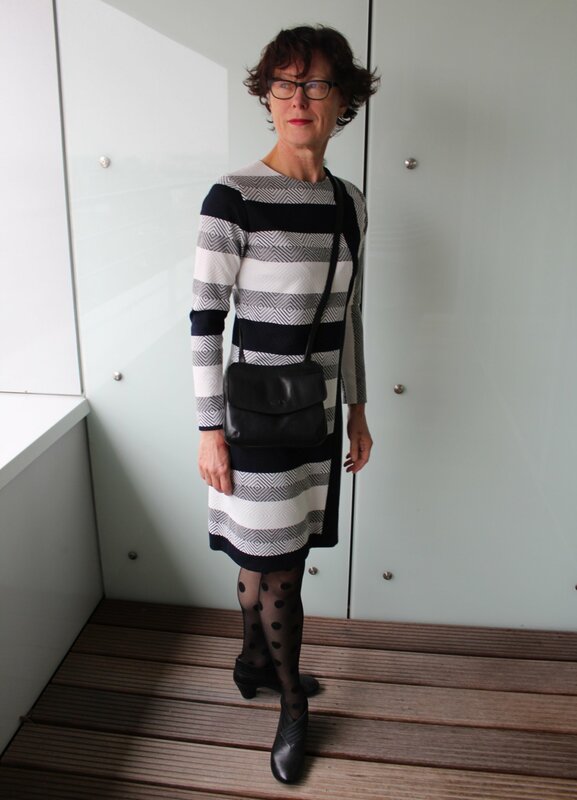 I wore the striped dress this week to a meeting and it was huge success. I did get a lot of questions where this dress was available (no one knows I sew my own clothes). So it was a big surprise when I told them it was homemade. Love love love both dresses! These are so stylish. The fabric and color are great and perfect for your style. They look fabulous on you! Such unusual dresses. i love the combinations of fabric and textures. You look great Sonja! Thank you so much for your lovely comment. I’m so happy with my dresses. I love your dresses so much!!! So chic!